Chocolate Covered Rainbow Strawberries are a fantastic treat to have this St. Patrick’s Day. With colorful layers of white chocolate inspired from the rainbow. Trust me the rainbow has never tasted so good. My kids are excited, claiming they can have more than one since it was a “healthy treat”. Right?! Umm, no. With 6 layers of chocolate, I would say this is more a chocolate dessert than a fresh fruit snack. None the less, it is the perfect festive treat and one could say the “pot of gold” would be the strawberry center. I love making fun recipes for the spring time, especially for the holidays like St. Patrick’s Day and Easter. I have to say that Easter is my favorite holiday to make goodies for. All of the colors are warm and inviting, the flavors fruity and sweet, then of course the salads…oh, my favorite part. 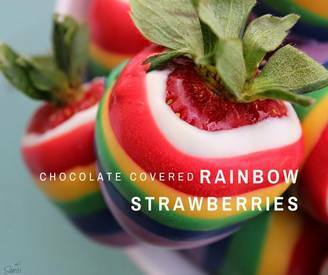 Celebrate the Irish luck with these Chocolate Covered Rainbow Strawberries, trust me they are better than a 4-leaf clover. Enjoy!